Anti-government alliance, Jatiya Oikya Front says it will take part in the 11th National Election, but called to have it deferred by a month. The announcement came on Sunday (Nov 11) during a media brief at the National Press Club. 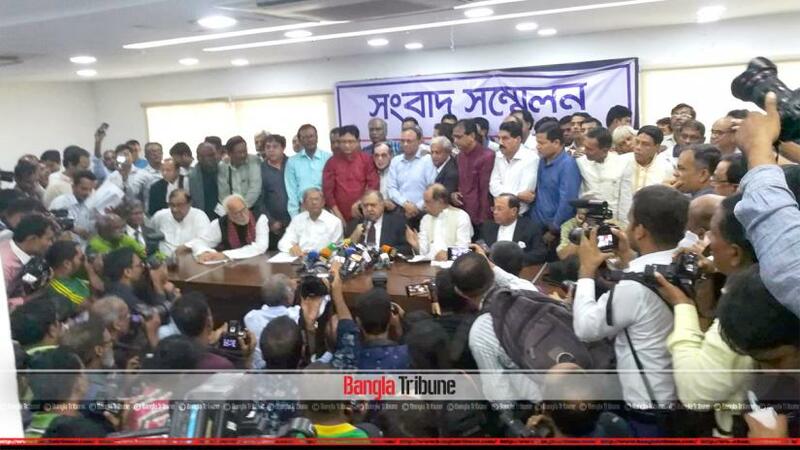 BNP Secretary General, Mirza Fakhrul Islam Alamgir read out a statement by the coalition's chief, Dr Kamal Hossain during a packed media conference. "We are still focused on our 7-point demands for ensuring free, fair and credible election in addition to the demand of deferring it by a month." It will be no different this time, he hoped. “This alliance has been forged on the premises of values ingrained in our constitution. This alliance aims to establish the power of people by achieving their faith,” said the Gana Forum chief. Mirza Fakhrul then read out Oikya Front’s official statement on behalf of the alliance chief, announcing their stance on the upcoming polls. Calling to defer the polls day by one month, Fakhrul said that their alliance will keep an eye on the election commission and the government.